As with all restorative poses, our aim is to feel grounded enough to fully relax and release tension. I invite you to practice the pose of the month for 10-20 minutes / day. Even per week is fine. 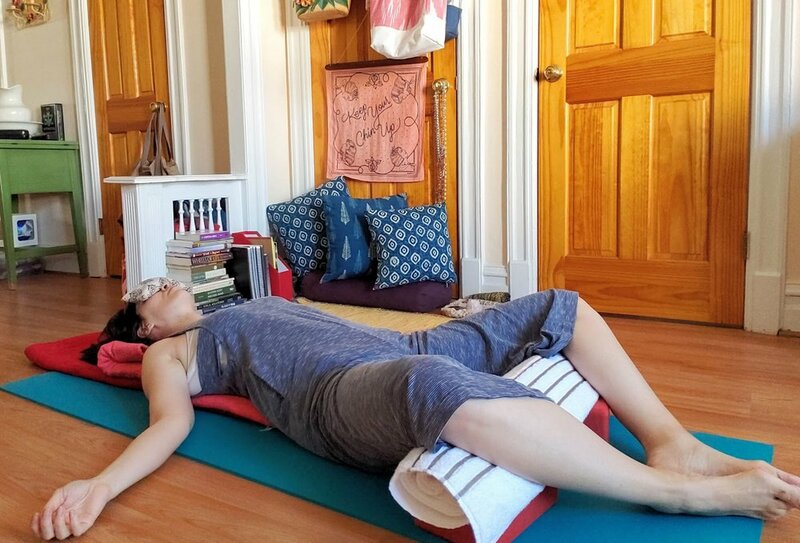 While restorative poses look easy, that doesn't mean they are. It can be difficult to really relax and remain silent with your breath for 20 minutes! Thoughts aren't so easy to let go of. Judgments may enter wondering what the point of this is, it won't give you six-pack abs or a beach body. If you find yourself having difficulty start with 5 minutes and slowly allow yourself relaxation. Conscious relaxation. The need to strive and drive keeps us in flight or fight. We need deep relaxation to reverse the damage on our nervous systems. Props: Two blankets folded into long rectangles. Two blocks. Another blanket or beach towel rolled up nicely. Eye pillow (optional). Scroll to the bottom of my RESOURCES page for my prop recommendations and where to buy them. Prepare: Lay the two long rectangle folded blankets on the top of your mat running long ways. Stack them so that the top one is slightly further back. Lay your two blocks on the mat with space between them. The rolled towel will lay across. Have your eye pillow handy. Shape: Sit with you back to the short edge of the long folded blankets but do not sit on the blankets themselves. With knees bent and feet on the mat, adjust your blocks / towel combo so that they fit nicely under your knees. Lay back onto the blanket stack. The blankets are there to fit the natural curves of your spine. If you'd like extra support under your head and cervical spine, fold the top blanket in as shown. Bring the soles of your feet together creating a diamond shape with your knees. Turn the flesh of your outer thighs down and let them spread and be heavy but still supported by the props. Your arms can lay at your sides with palms up or down or rest on your belly. Your eye pillow is there to block out the light and allow you to go within. Practice: Make any adjustments necessary to ensure that you are comfortable. When ready to settle into pose, enjoy several long breaths to allow yourself to sink into the ground. Feel the support from the floor, or imagine mother earth below you. Relax, and deepen into this grounded feeling for 10-20 minutes. Come to notice your breath. Take note of your inhales and exhales. No need to change your breathing pattern but just notice. Let go of the thoughts that enter your mind. If that becomes difficult, come back to noticing your breath.